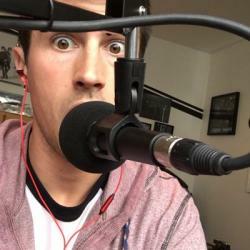 The iPad, arguably the world’s most popular tablet computer (and the clear leader in tablets over $200) is a great device for consuming content. Whether it’s surfing the web, shopping Amazon, or enjoying your favorite TV and movies, the device has done a great job of planting roots as a way to do “basic” tasks quickly and effectively. I have always envisioned the iPad as more than a consumption device, though. Apps like Workflow ($2.99), iA Writer ($3.99), Ferrite (Free), Apple’s own iWorks suite, Mail.app, and others have made me excited to transition various parts of my work to my iPad. Whether it’s churning through emails, automating data processing, or writing reviews, the iPad has become an invaluable tool for me to be efficient – even with a MacBook Pro at my disposal. To truly feel productive on the iPad, though, I find the need for a keyboard when I’m in “working” mode. Responding to emails and writing reviews while typing on glass isn’t impossible, but my typing speed is significantly improved when I can press physical keys, which has led me on a bit of a hunt for the ideal keyboard solution. So what makes a good iPad keyboard? Is it the function of the “keyboard” outside of typing? The feel of the keypress? The additional protection a keyboard case offers? Perhaps it’s a mix of a lot of things. Back in 2012, my wife purchased an iPad 3 for me as a birthday gift. That fall, I picked up a ZAGG Keyfolio (with backlight). It was nice to type on, but after about 4 months of use, it was passed along to a coworker. The main reason: when I wanted to do iPad things (touch screen stuff that involved holding it like a tablet), the keyboard was totally in the way. In 2015, I purchased an iPad Air 2. Instead of getting a keyboard case, I opted to pick up the Smart Cover and the Anker Ultra-compact Bluetooth Keyboard. As soon as I began using these 2 pieces in conjunction with one another, it became clear that having the keyboard out of the way when it wasn’t needed was the ideal way forward. When I was at home, sitting on the couch, I could flip open the smart cover and use my iPad in all the ways Apple had intended. 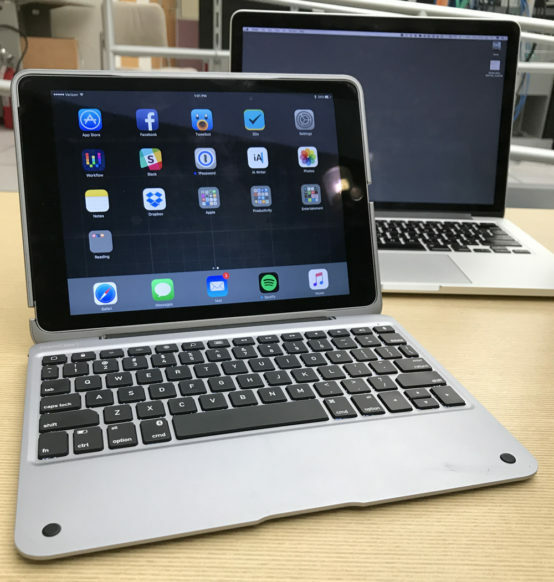 When I was at work and hoping to do some more productive work, I’d pull the Anker keyboard out of my backpack, and prop the iPad up with the Smart Cover. Unfortunately, the big flaw here was that I needed to carry two things to “do work” – the iPad and the Keyboard. When I had a bag, it wasn’t an issue, but when you show up to a meeting and have to assemble your work station, you get funny looks. Trust me. 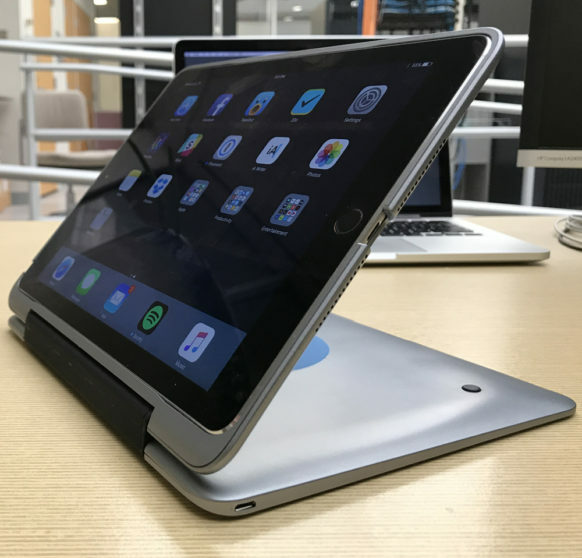 After about a year of toting my iPad and Keyboard around, and typing on glass when I didn’t have my keyboard, I stumbled across the Incipio ClamCase, which sported an iPad-sized compact keyboard layout with a full case to protect the iPad. What made the ClamCase unique was its ability to fold over on itself. I won’t do a full review of the ClamCase here (let me know if you want one, though) – let’s just say it offered some promise as I sought out a solution for a self-created problem. Once again, as was the case with the ZAGG Keyfolio, I quickly found a reason to ditch the ClamCase. First and foremost, it’s bulky. This is easily the biggest issue with keyboard cases – they add thickness to the iPad on the front and back. When the case was flipped back, to allow full “tablet mode”, the entire assembly is thicker than my 13″ MacBook Pro (2013). It’s also heavy, which makes using it comfortably in any elevated position exhausting. 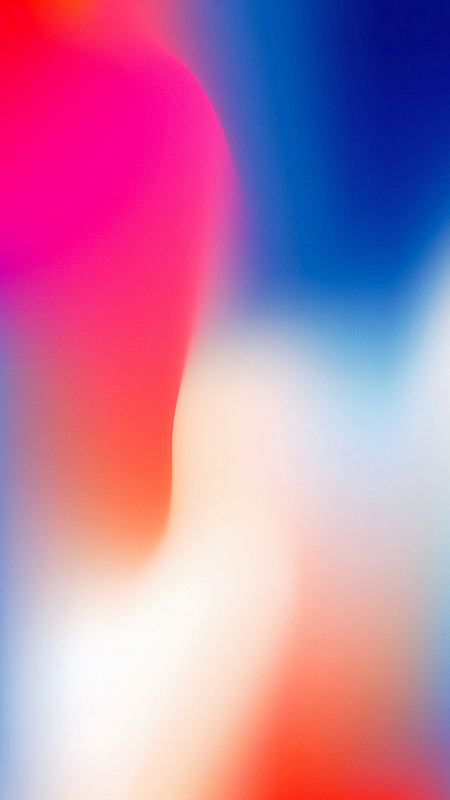 Jump ahead to today – I am now in possession of an iPad Pro (9.7″). Being a big fan of the Smart Cover, I decided to try out the Smart Keyboard (borrowed from another co-worker). Typing on the keyboard isn’t bad, and when you’re not doing keyboard things, it tucks out of the way without adding significant bulk. It also functions as a stand with or without the keyboard kicked out. 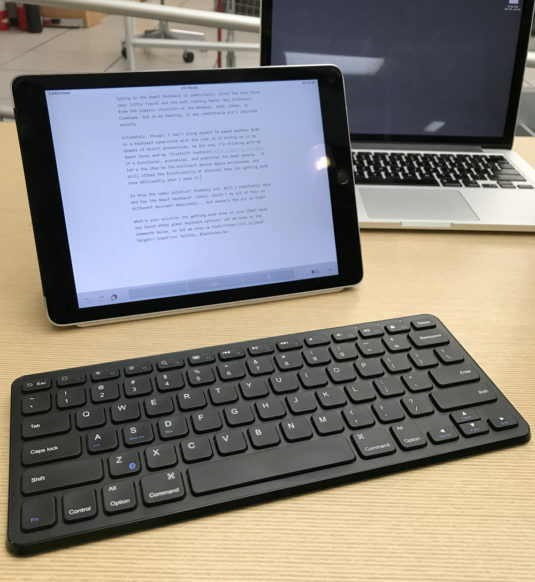 I know there has been some “controversy” about whether or not typing on the Smart Keyboard is comfortable, since the keys have very little travel and the soft coating feels very different from the plastic chicklets of the MacBook, ZAGG, Anker, or ClamCase, but in my testing, it was comfortable and I adjusted quickly. 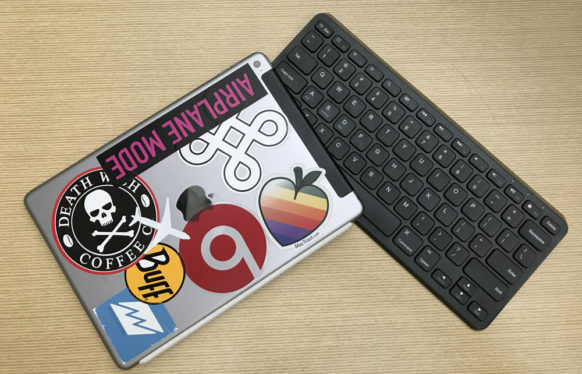 Ultimately, though, I can’t bring myself to spend another $150 on a keyboard case/cover with the risk of it ending up in my drawer of misfit accessories, so for now, I’m sticking with my Smart Cover and my bluetooth keyboard. It’s functional, economical, and practical for most people. It let’s the iPad be the brilliant device Apple envisioned, and still offers the functionality of physical keys for getting work done efficiently when I need it. Is this the ideal solution? Probably not. Will I eventually cave and buy the Smart Keyboard? Likely. Could I do all of this on different devices? Absolutely… but where’s the fun in that? What’s your solution for getting work done on your iPad? Have you found other great keyboard options? Let me know in the comments below, or let me know on Twitter, @IanFuchs!